I remember when my children were little they went through a period when they wanted me to read them only one book. Again and again and again. It was a colorful, richly illustrated allegory based on an ancient Indian fable. This is how the story went. In a remote village in India, a number of blind men lived in a house together. They mostly got along, but sometimes they argued about the world around them. Each man felt he understood the nature of things better than the others. One day, a mysterious traveler passed through their little village. The blind men offered him hospitality, and in return the traveler told them about a glorious and magical animal – an elephant. He hadn’t seen an elephant himself, but he had heard that this animal was the wonder of the world. The blind men were intrigued. It was their greatest wish to touch an elephant and to understand what this glorious being was like. Years passed. The men didn’t forget the elephant. In fact, as time went on their desire to touch this wonderful being grew greater and greater. And then, one day, their wish was fulfilled. A caravan of merchants was passing near the village and the news spread quickly that an elephant was heading their convoy. The blind men sent word inquiring if they could visit the caravan and touch the elephant. The gracious merchants were pleased to grant their wish and invited them over for tea. The blind men spent the entire day dressing in their finest clothes, preparing for the meeting. In the afternoon, their guides took them to the field where the caravan was resting. They were well received. They had tea with the merchants and were then allowed to inspect the glorious elephant. It was a day full of excitement. Every man had touched one part of the elephant and thought that was the entire animal. Their servant’s little son, sitting near them heard them arguing. He had never seen the elephant himself, but while listening to them he had an idea. 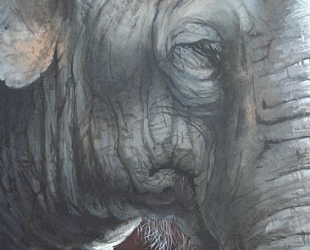 “Maybe the elephant is the huge trunk, a giant ear a huge leg, an eye, and a tail, too.” The blind men stopped talking and listened to the boy. And they realized that he was right. The glory of the elephant was in their willingness to share and combine their visions, and experience the elephant through each other’s eyes. Everyone held a piece of the puzzle. My grandfather told me this tale when I was young. That came as a shattering revelation that the entire world and its people were not only America or Americans. It’s all in how we see things and interpret them, and who says a given group’s opinion is right and should be forced on everyone? I love this story and am so pleased that you know it as well. The world is such a glorious place, with all its variations and differences; all I know is that is would be terribly boring if everyone were the same.